If you also have Blu Ray disc and want to play Blu-Ray movies on Surface, you can visit the guide on how to convert to play Blu-Ray on Surface RT/Windows 8 Pro. To play various kinds of video on Surface RT or Surface Pro, visit the detailed guide on how to convert MKV, RM, AVCHD MTS, AVI, WMV to play on Surface RT/Pro. Click “Load DVD” to load DVD, DVD Folder or IFO files. Click the “Profile” drop-down menu to select “H.264/MPEG-4 AVC Video (*.mp4)” format from “General Video” category. 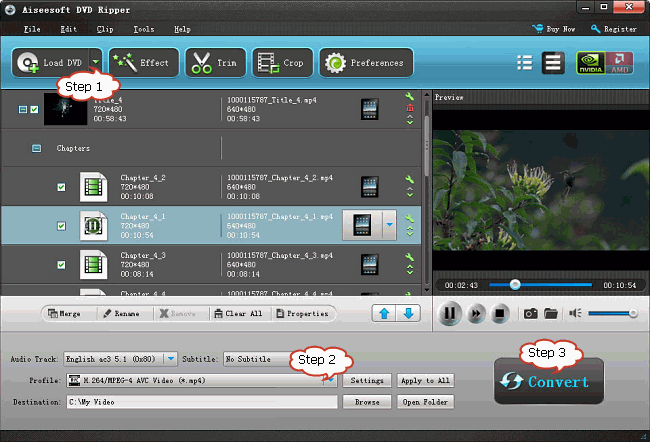 Click the “Browse” button to set the destination folder for saving output video. Press “Convert” button at the bottom right to start converting DVD to Surface RT or Surface Windows 8 Pro.